Not as bad as I feared, thank goodness! After my kick back run on Sunday my stiff right ankle became stiffer and stiffer, to the point that I could no longer walk without a pronounced limp. To say I was worried was an understatement. I couldn’t decide exactly where the pain was coming from, which made dealing with it difficult. Depending on what was causing the pain I was to stretch, or not to stretch. Dilemma City! I tried icing my heel and ankle and used an stretch band to work on the mobility of my foot. I even stopped running in an effort not to make things worse. I haven’t run since Sunday. I wore a heel lift which took some of the pressure off my Achilles, which was sore and worrying me most. 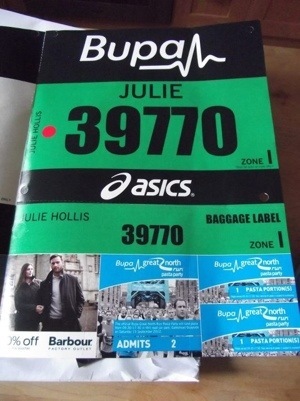 I don’t need injuries now, with just two weeks to go before the Great North Run. Yesterday I could no longer deal with the mental stress and rang for an emergency appointment with my chiropractor. I described my pain; basically it felt as if I had a tight band around my lower leg. I’d been probing and had identified nodes in my calf that were painful, taking my thoughts away from Achilles Tendonitis. My chiropractor listened and then got the baby lotion out. Oh no, not the baby lotion! Those of you who have endured a sports massage will understand my fear at the sight of baby lotion! This indicates that the next few minutes are going to H.U.R.T. My chiropractor identified, almost immediately, that my foot was virtually immobile. He thinks that I had somehow jarred it before my last run and, as a result, was running in a compensatory style which caused the rest of the problems. He worked on improving my range of ankle movement, including a few quick adjustments, and then looked at my shins. That’s when I hit the roof. Aside from childbirth, I don’t think I’ve felt pain like that. Needle sharp rips down my leg followed his slippery hands, excruciating but gradually getting easier with every movement. My calves got a similar treatment – just as painful, but I knew that one was coming! I left with better ankle movement and a lot less pain. My Achilles is slightly swollen, so I need to ice that for 15 minutes a day, but it’s nothing to worry about. Last night my ankle looked puffy, but elevation sorted that out. I still have a less stiff ankle, so I still need to work on improving its mobility and I’m allowed to stretch it out once its warmed up. So, here I am. I still haven’t run this week so I’m planning an easy treadmill run tonight, just to test it out. Fingers crossed! A Greek Leg-end, Magic Miles and Soldiering On. I do try hard with my titles – does it show? The meaning of each should become clear as you read. Bear with me! After Monday’s long run I was left a little sore (I may have mentioned this already), but elated by my time. To be honest, I no longer care how well I run the Great North Run. I understand from others that it’s unlikely that I will better my PB as it’s so busy. Over 40,000 other runners will be doing the same thing – that’s a massive field and my experience of even tiny races has shown that people just don’t know how to get out of the way. So, I’m not expecting much. I did a recovery run on Wednesday. It was raining so I just used the treadmill and watched a movie as I ran. I turned the music off the Jeff Galloway app and just listened to him telling me when to run and walk whilst watching The Time Traveller’s Wife (again); it made a pleasant change from The Matrix. 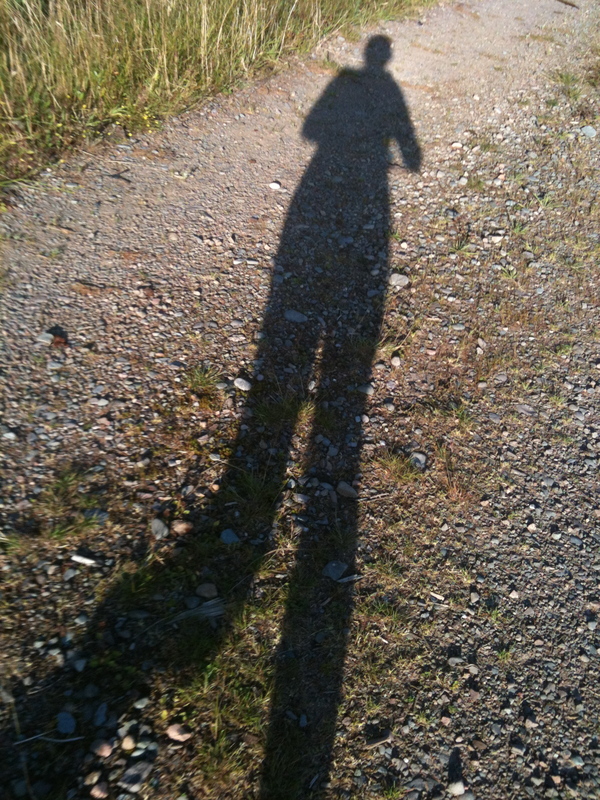 I ran approximately 2.5 km at 9.5 kph and 2.5 at 10.3 kph. It felt good and I was pleased to just be running. On Friday I was due to run again, but I just didn’t feel like it. That doesn’t happen often and I wasn’t going to force myself to run if I didn’t feel right. This is meant to be a pleasure, not a torture! Instead I relaxed and watched a long awaited biography of George Harrison which I’d recorded in November last year! On Saturday morning I suddenly realised that it was, in fact, Saturday and not Friday as I’d thought. This is what comes of basing your week on days that you run! Because I had run on Monday instead of Sunday my entire week was a day off! This all said I had to run on Saturday morning before heading to work because if I’d left it I could have been running Sunday morning, less than twelve hours before. I’m a firm believer in rest days. I opted to run on the treadmill again, for quickness more than anything. I ran with Jeff’s app, running at 10.3 kph until the last three minutes during which I gradually edged the speed up by a kph until I was finishing the last minute on 13 kph. Even on my easy runs I like to sprint finish. One thing I did notice though was a stiff right ankle. Initially I thought it might be Achilles and those of you with knowledge of Greek mythology will know that Achilles was a bit of a Greek legend. 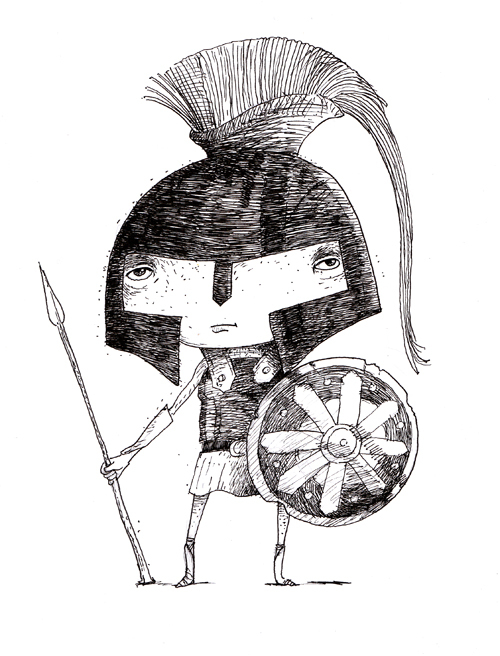 My Achilles, of course, is more of a ‘leg-end‘. (It doesn’t get much better, believe me – you can leave now if you want!) I remember catching my ankle awkwardly in the week and it’s been a bit stiff since. I’m trying not to panic about it, but the very last thing I need now is an injury. Yesterday was Sunday and, in the middle of a very busy day, I decided to get my long run in. This was a step back week, with a prescribed 4 miles. In the middle, though, was a Magic Mile challenge and, with my previous experience of Magic Miles, I was not looking forward to it, especially as my ankle was still not quite feeling “right”. However I set off mid-afternoon in warm and humid sunshine with my coach (hubbie) biking alongside me in semi-silence. I ran my usual 4 mile route which takes me uphill for the first mile and then undulates for the next 2.5, before finishing on a steep hill. I can certainly pick my routes! I set off too fast, running at 8 minute/mile pace, and had to consciously slow myself down. Trouble is now I’m starting to feel stronger and the temptation is to just speed up, but I really don’t want to pay with consequences at this stage in my training. I have no idea if I could maintain a faster pace for any decent length of time, but I’m not willing to test it out just now. Once I’d almost finished climbing the mile long hill out of Ruthwell Station Jeff announced the start of my Magic Mile. I stopped, cleared the Garmin and set off. I tried not to check my pace, but listen to my body – trying to judge how fast it could go for the next mile. The route was hilly, so I wasn’t doing myself any favours other than benefitting from some downhill sections. I ran it reasonably hard and finished it in my fastest mile time so far of 8:58. I’m pleased with that because it’s a PB for a mile and I also felt that I could have pushed a little harder, even on that route. I felt strong and I know that my semi-silent coach thought it was good because he actually spoke. That puts me bang on pace for a 2:20 half marathon, which is great. I finished the rest of the run at an easy pace doing half a mile more than asked, just to get me back into the village. All in all, if I add the times and pace together, I did 4.51 miles in 48:59, giving me 10:51 min/mile pace – easily under my 11 min/mile target. My ankle today is stiff. Not sore, not Achilles tendonitis sore, just stiff so I’m using ibuprofen to take away any possible inflammation, doing my mobility exercises and stretches and considering strapping it up for next weekend’s 14 miles long run. It concerns me, but, as I said before, I’m trying not to panic. I plan to soldier on in a relaxed, not quite regardless state of mind. I am not panicking, really, I’m not! After my meeting with my chiropractor last week, everything started to make more sense. Yes, I run far better off road than on. I’m more relaxed and my posture is totally different. I realise that the terrain has much to do with this, but so does my shoe. I run off road in old Nike Alvord 7s that probably stopped being made five years ago, but bought them from the Nike Outlet at Gretna just last year. They’ve only got 100 miles on them because my off road running tends to be only 3 miles long. When I was on holiday in Harrogate last week I went along to Up & Running in the town centre. I wasn’t running yet because my back was still sore and I was certain that I needed to heal properly before going out again. A few days missing running are neither here nor there. I did a fair bit of walking to make up for it. The guy at Up & Running was extremely helpful. He put me on the treadmill and videoed my running style wearing Brooks Ghosts. Not wanting to say anything against the analysis of my style done previously, he wondered if my style had changed significantly. Read into that what you will! In any case I do not over-pronate; if anything I have a neutral footfall. I don’t toe strike either though. I land mid foot, which is good. I watched the video with him and was really surprised how straight I run. I’d always imagined that my right leg, the twisted one, would kick out more, but it doesn’t really. I do a good job of straightening it out and putting one foot in front of the other. It’s very strange watching yourself running! The short story is I left the store with a pair of Ghosts, a free pair of socks and good wishes for the Great North Run. I didn’t test them out until Sunday when I ran into Harrogate and back for a 4 mile run. I’d forgotten that it was a Magic Mile run and I wasn’t really up for one, if I’m really honest. I should have just run my 4 miles at 11 min/mile pace and enjoyed it, but I did try to do a MM and failed miserably. I didn’t really know where I was running, I was crossing roads constantly and having to stop to do so and I wasn’t physically fit enough! My MM came in at 10:24, which is abysmal for me. I did enjoy the easy run back though and I love my new shoes. 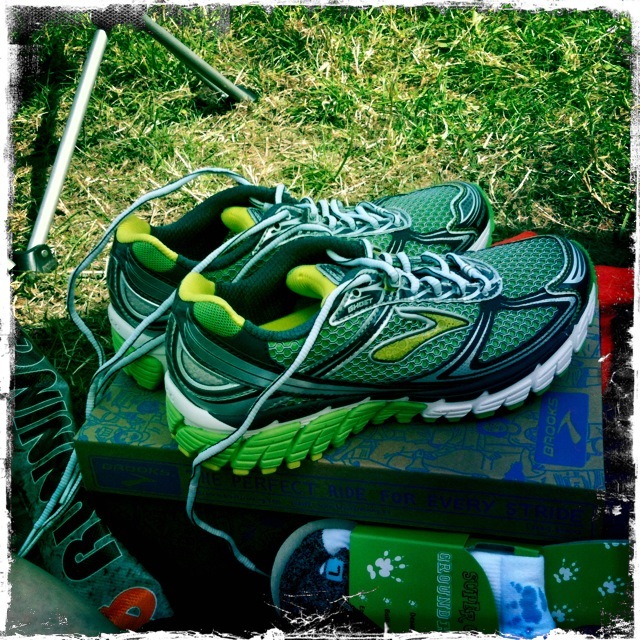 They are comfortable and I had no issues at all and, wonder of wonders, my back was totally cured post run. I’d gone out feeling a bit tight and stiff and returned without a twinge. Yesterday I took my dog for a trail run on my usual 3 mile route. It was very warm and humid and I said to my husband that I was just out for an easy 3. My Garmin had died so I took Jeff’s app and listened to the music – not something I do often on the trail. I started off easy and just ran. It was a lovely evening and I was enjoying myself. I found my running easy and I felt strong, even the uphill sections were easier, although I should have known that something good was happening when my core started to ache. When I finished I realised that my easy 3 had turned out to be the fastest 3 I’ve ever done off road. 3 miles in 30:19. It’s lovely when that happens. This morning I’m a tad sore. Understandably when you think how my poor back was manoeuvred back into place yesterday, albeit by the gentlest of hands. I’m taking it easy, still taking co-codamol even though they seem to upset my stomach and I’m not planning any running today. I did ask my hubbie to put the exercise bike into the Wee Gym as I may have a few kilometres on that later. I’ll see how it goes. I’m a big fan of listening to my body, although I realise that running 11 miles on Sunday having cricked my back wasn’t really harking what it was trying to tell me. I’m obviously paying the price now, although how much worse I’ve made it we’ll never know. I suspect that I haven’t added much to the load. In an effort to lift my spirits Life yesterday sent me my Great North Run number! It was a slightly scary, but welcome sight, making the experience a little bit more real. However, I’ve now started to worry about logistics which those of you who are long term readers will know that I can be OCD about arrangements! We will be staying at Whitley Bay on the weekend of the run, so I need to spend time working out how to get to the start line (I don’t care about getting back!) on time for a 10:40 start. I need to work back to see what time I need together up, have breakfast and get my kit on. I know, it’s August. I have a full month to worry. Dear God. I would welcome any advice from locals and veterans of the GNR! OK, so here I am at the end of what was apparently my ‘rest week’. I guess I’ve never called it that before; to me rest means rest, not just lower mileage. So in my eyes here I am at the end of a low mileage week. There, that’s better. Pedantic Pete gets it right! So this week has me looking forward to 11 miles at the weekend, after two short runs in the week, one of which I’m just about to go and do. That’s the run I know! In any case, that’s as flat as it gets, which is fine – at least I’m hill ready! I did my 4 miles in a steady 44:12, which gave me a nice pace of 10:25. I set off too fast, I know that. I was listening to ‘Motorcycle Emptiness’ by the Manic Street Preachers and couldn’t find the right pace. Sounds silly, but there must be an odd beat to it. My first mile was 9:40. I’m supposed to be running my long runs at 11 minute miles, but only the last two were that slow. I’m not worrying too much about that. Today it’s still raining after an almighty downpour last night, so the treadmill is getting a hit again, although I’m tempted to run it all on the incline. I’ll see how that goes! My treadmill has a manual incline of, we think, about 5% which might be a bit much for the whole run at 10 minute pace. I can see me jumping on and off the belt doing mid-run adjustments!! I’m also picking up an exercise bike tonight, which should help with my cross training. So, 11 miles on Sunday. I’ll see you on the other side!